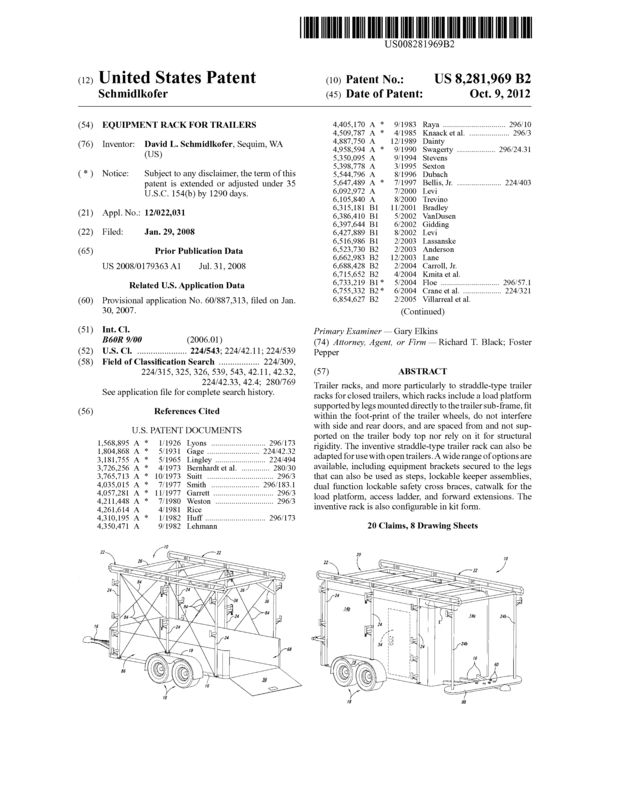 Trailer racks, and more particularly to straddle-type trailer racks for closed trailers, which racks include a load platform supported by legs mounted directly to the trailer sub-frame, fit within the foot-print of the trailer wheels, do not interfere with side and rear doors, and are spaced from and not supported on the trailer body top nor rely on it for structural rigidity. The inventive straddle-type trailer rack can also be adapted for use with open trailers. A wide range of options are available, including equipment brackets secured to the legs that can also be used as steps, lockable keeper assemblies, dual function lockable safety cross braces, catwalk for the load platform, access ladder, and forward extensions. The inventive rack is also configurable in kit form. I'm looking for an outright sale of my patent. I have never tried to sell the product seeing that I'm busy with construction and I know that it would take more time than I have. There is nothing else like this product on the market. There are less qualified racks but they do not meet the standards that my product does. I originally created this because there was nothing like it on the market. Page created at 2019-04-24 23:58:39, Patent Auction Time.